In several countries it has already become a tradition to celebrate the secretaries in recognition of the good management they perform within an organization, whether small or large they deserve a greeting from their bosses and coworkers. We have in this article the best selection of phrases that you can share to a secretary for her day. 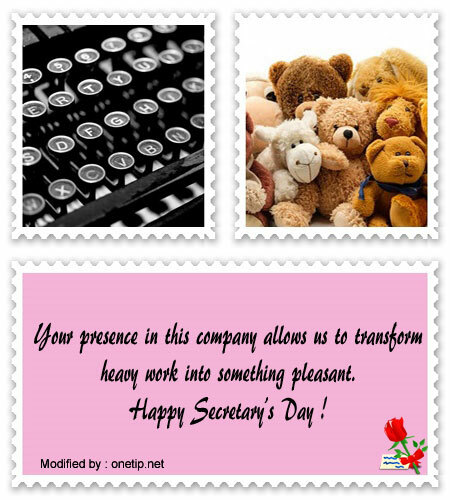 We invite you to take a look at the new examples we are publishing for you to send a nice dedication for Secretary’s Day. :: “Having you as secretary of this company gives us the assurance that everything will always be in order. Happy Day“. :: “You are very punctual in your work, discreet, respectful, and you also like to foster union among co-workers. Happy Secretary’s Day”. :: “A special thank you for fulfilling with efficiency and vocation the assigned tasks. Happy Secretary’s Day”. :: “You are the perfect Secretary and you cover the demands of this organization. Happy Day !”. :: “Because of your great professionalism, I know you would never disappoint the trust placed in you. Happy Secretary’s Day”. :: “We value the dedication that you put in the exercise of your functions and your role will always be fundamental for the success of this management. Happy Secretary’s Day”. :: “You are an excellent person who gives everything for the effective fulfillment of your functions. Happy Secretary’s Day”. 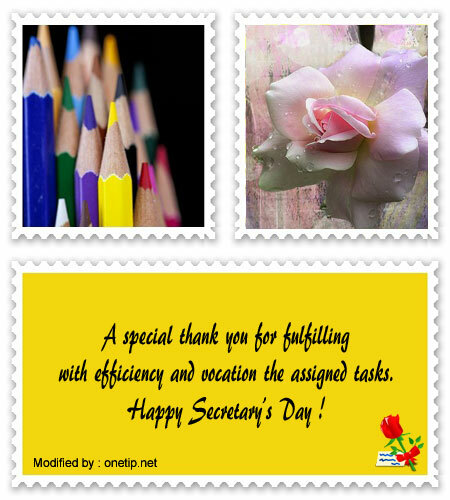 :: “Happy Secretary’s Day, thank you for giving us your collaboration every day with professionalism”. :: “Happy Day for you that you are a secretary, a friend and a co-worker: the column that supports this company”. :: “Dear secretary, I wish you the best in your day, thank you for all your efficiency and companionship”. :: “I thank you for being part of the team of professionals who carry out this organization. 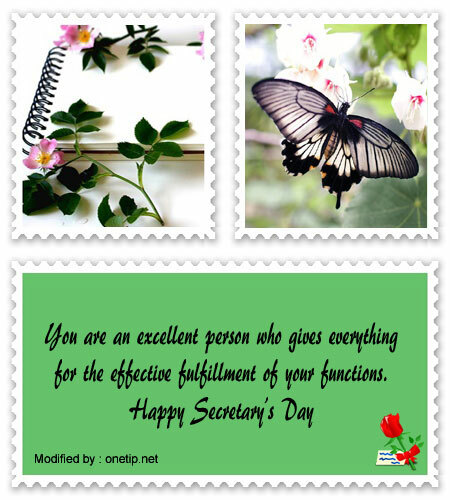 Happy Secretary’s Day”. :: “Much of the success of this office is due to your professionalism. Happy Secretary’s Day”. 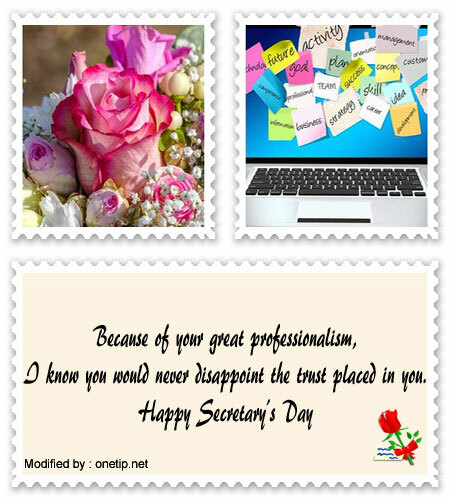 :: “You are always valued by our team, we wish you a Happy Secretary’s Day”. :: “Thank you for assuming responsibly the functions assigned by this organization. 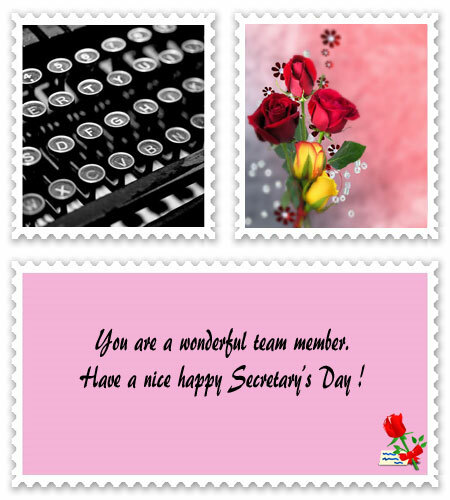 Happy Secretary’s Day”. :: “Thank you for the enthusiasm and determination to carry out your functions. Happy Secretary’s Day”. :: “Only to a great professional like you we trust the administrative management of this company. Happy Secretary’s Day”. :: “Thank you for fulfilling the assigned functions with discretion and professionalism. 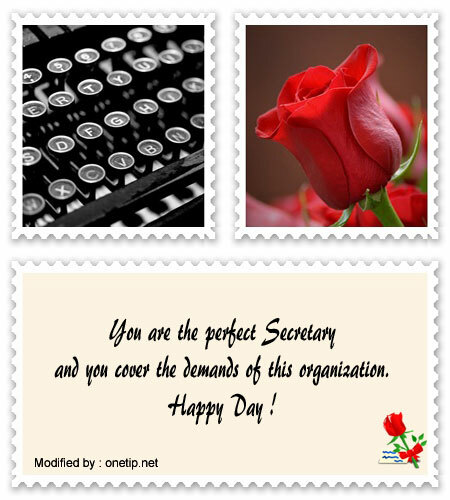 We wish you a Happy Secretary’s Day“. :: “The role you fulfill in this organization is always valued and you have all our support and confidence. Happy Secretary’s Day”. :: “Congratulations, dear secretary, for fulfilling the administrative and personal tasks with discretion and competence”. :: “Thanks to your efficiency we can entrust you with other more delicate administrative tasks. Happy Secretary’s Day”. :: “Your presence in this company allows us to transform heavy work into something pleasant. 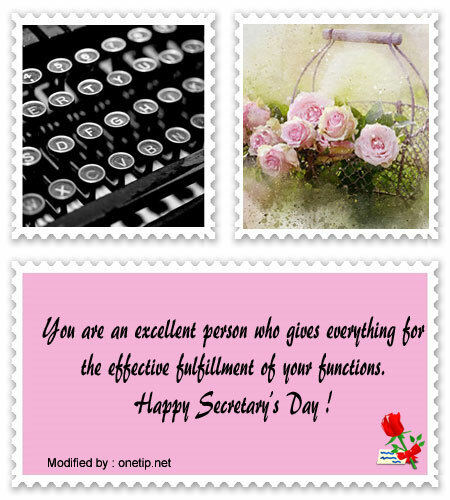 Happy Secretary’s Day”. :: “You have a very important role and thanks to your way of being it is nice to work with such a nice and efficient secretary as you. Happy Day”. :: “We recognize the fundamental role that you fulfill in this company. Happy Secretary’s Day”. :: “You are cordial, you efficiently perform your work and thank you for projecting a good image of this organization. Happy Secretary’s Day”. :: “You have a very positive attitude for the development of your work, thank you for spreading your enthusiasm and good humor. Happy Secretary’s Day”. :: “You honor your position, you keep the best secrets of this organization. Happy Secretary’s Day“. :: “Not only are you aware of the secrets of this company, you have also become my therapist and confidant. Happy Secretary’s Day”. :: “Your effort is daily and you always give us your good energies to make the workday less hard. Happy Secretary’s Day”. :: “Thank you for being part of our team and for receiving us every morning with a smile. Happy Secretary’s Day”. :: “I am lucky to have an excellent and unmatched professional. Happy Secretary’s Day”. :: “Only a professional like you knows about details, you are aware of what can escape our senses, you are admirable. Happy Secretary’s Day”. As a good boss, co-worker, dedicate a nice greeting to the secretary in her day. See you soon. Some careers are meant to last forever, they are so important that it would be very difficult for them to disappear, as we all need the help of that professional, as is the case of secretaries. They are critical because they keep documents right where they should be and in order, which is vital for every company, and they are also the ones that have direct contact with the customers. They have to be very well treated and they have to feel comfortable working for the company in order for everything to work out perfectly. So, write a text and send it to this special person. – “Sometimes people do not know what your job consists of, but for me it is vital for the company; I do not know what we would do without you. I admire your simplicity, kindness and above all, your pro activity, you are always willing to help anyone with anything they need. – “All we have achieved and the image of the company we have today is largely because of you. You work very hard and give your best so that everything works out well. We see in you a role model, you have many values and you treat people well. – “There are people that do not show any gratitude for the people who do so much for them, as they think they deserve it all I feel sad for these people as they do not know how to value all the good things they have around them. – “A secretary does not only smile to everyone who comes by the company, they also have a lot of tasks that are valuable in the workplace. – “As life goes by, there are some people who stay with us forever, others that just pass by a little moment, others that are not important at all and others that are like birds of passage. We should be always thoughtful with the people that are working with us, like secretaries. Let us be friendly with them. See you soon. Humanity has developed greatly, societies have grown, and with them, many needs that have to be met have been created. To cover everything that is needed, man has been developing a series of jobs and professions which have several functions that help for everything to take place in the best way possible in various areas of everyday life. There are professions that are timeless, that is, over the years they have become very necessary and they seem that they will last for many more years because the roles they perform are useful for everyone. Among these types of professions, we find the secretary one. It is really important because secretaries are the ones responsible for keeping a proper registration of documents, and this is crucial in any company. Also, in many cases they are the face of the company before the customers, they represent organizations and are always providing the best service possible. Honestly, to find a good secretary is not easy, so if we are blessed and fortunate to have one, we should show the appreciation we have for them. So do not let this day pass without doing one small gesture for her, such as the messages you will find below. – “There are times in which your work is not recognized the way it should, but the truth is that if you did not do all that you do, the organization you work for would crumble. You are a modest and helpful person, always willing to help, to do things in the best way and that is very admirable. – “The achievements we accomplish that are the ones commented very much, are in a very important measure due to your work, your effort and your dedication. You are one of those people who just know how to set the example, with impeccable ethics and valuable patterns. Counting on it, is that we allow ourselves to make you this gift that we hope you enjoy in the company of your loved ones, because there is always time for a little rest and relaxation. – “I know people who do not value others, who do not value what they do, that assume that everything has to be perfect all the time. I think they could not be more wrong. Good work should always be valued as it should and always appreciated, especially when it comes from people who, in addition to being good professionals, are also a good people. – “Secretaries are not only there to answer to people with a smile on their face, but their duties go far beyond that; they have an organizational task that would overwhelm most people, and they must have impressive records and the ability to do things simultaneously that would frighten anyone as well. – “There are those who are only in our lives a brief moment, those who do not set any tone, those who we do not miss and even after a while we do not remember. – “When the prizes of the person that gets the entire company moving come out, probably the construction of a monument to your name will start in the central lobby. Let us not take for granted the work that secretaries do, because it is much harder than most people think. Let us be grateful and consistent, not only with them but with all the people, remember that we do not often know what kind of life there is behind their smiles. If you liked this page you can help us by giving us a “like” on facebook, G+, twitter. Also if you want you can help this website by sending your originals secretary’s day messages, and will be published, others friends will thank you .